Daniel W. Yohannes ('76) was sworn in on April 15 as the United States Ambassador to the Organization for Economic Cooperation and Development (OECD). He was nominated by President Barack Obama on September 11, 2013, and confirmed by the U.S. Senate on April 9, 2014. A former banker from Englewood, Colorado, Mr. Yohannes has more than 30 years of experience in banking and economic development. Prior to his appointment, Mr. Yohannes served for more than four years as the Chief Executive Officer of the Millennium Challenge Corporation (MCC), the independent U.S. foreign aid agency that is helping lead the fight against global poverty. Prior to his government service, Mr. Yohannes was the President of M&R Investments, a firm specializing in financial services and the renewable energy sector. 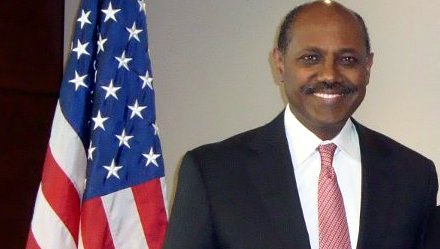 Before launching M&R Investments, Mr. Yohannes was a leader in the financial services industry, working in various roles throughout his career including as Vice Chairman and member of the Management Committee of U.S. Bank, President and CEO of Colorado National Bank, and as the Executive Vice President of Security Pacific Bank (now Bank of America). Passionate about protecting the environment and creating practical methods for implementation, in 2006, Mr. Yohannes co-founded the New Resource Bank in San Francisco, California to invest in green projects and environmentally sustainable businesses in the community. He also served as chairman of the Greenprint Council, a leadership group established by the Mayor of Denver focused on improving the environment of cities and reducing greenhouse gas emissions. Mr. Yohannes is active in his community and has served on various boards and civil organizations, including the Board Project C.U.R.E (Commission on Urgent Relief & Equipment), the National Jewish Hospital, the Denver Art Museum’s Board of Trustees, the Smithsonian National Board, the Board of Directors of Media One (now Comcast), University of Washington Michael G. Foster School of Business, Pacific Coast Banking School, Boy Scouts of America, First Western Trust Bank, New Resource Bank, and the Board of Advisors for the University of Colorado Medical School. Mr. Yohannes graduated from Claremont McKenna College with a B.A. in Economics and earned an M.B.A. from Pepperdine University. Born in Addis Ababa, Ethiopia, he is fluent in Amharic. The United States is a member of the Organization for Economic Cooperation and Development, which is an international organization, composed of 34 democratic countries with market-based economies. Shared goals include achieving sustainable economic growth and employment and a rising standard of living in member countries as well as engaging with non-members to contribute to the development of the world economy. Through its cross-country economic research, “soft law,” and effective peer reviews, the OECD is a dynamic international incubator for new ideas, providing the United States an opportunity for engaging with other countries on economic policy.